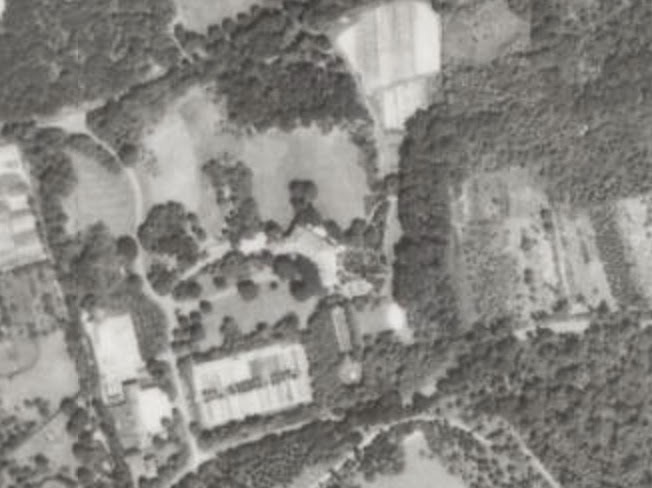 A 1938 aerial of 'La Selva', the Henry Sanderson estate designed by Hunt & Hunt c. 1915 in Upper Brookville. Click HERE and HERE for more on 'La Selva'. Photo from Stony Brook University's Digital Archive. Yes it was and I believe it's still standing. I have always loved this one. There are times I wished I lived on Long Island or near Long Island so I could go on these tours of these great mansions. Actually sold to an excellent conservation buyer who also restored and owns and is keeping another (somewhat smaller,but still substantial estate). Very fortunate. Good to hear. I wish more like that would buy on Long Island. Extremely good to hear. NSP must be correct as a great deal of landscaping and repairs have taken place recently along the entrance drive and the grouds are immaculatle. If you want to see some of the interiors including the grand staircase, HBO's Boardwalk Empire filmed plenty of scenes last season inside the mansion, which was masquerading as a Florida Hotel back during the land boom era. So glad to hear that it is being cared for! I visited La Selva when it was owned by a religious order and again a couple of years ago when it was featured in a Designer Showcase. The house is beautifully sited on the crest of a small hill with beautiful landscaping. Great interiors, especially the circular staircase and the mural in the dining room. I spent hours wandering around the house and grounds.